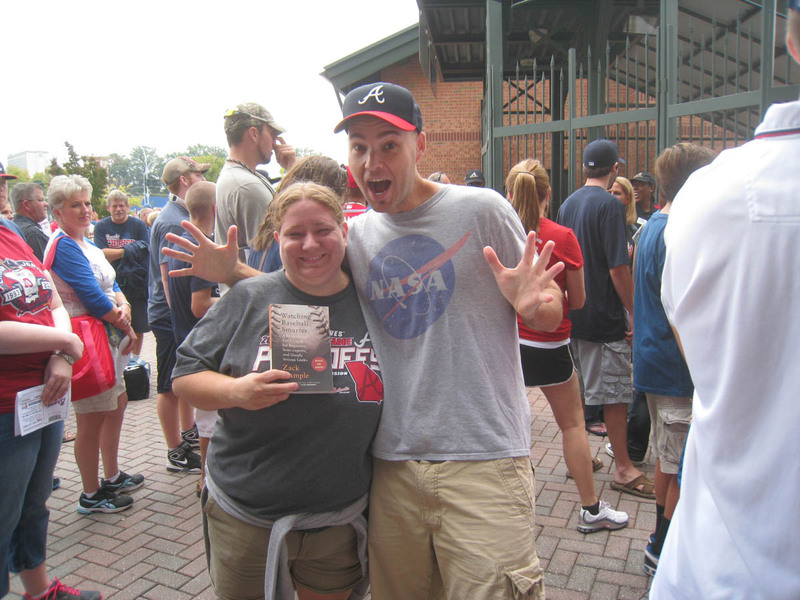 As you can see, she was holding her copy of Watching Baseball Smarter, which I signed for her. 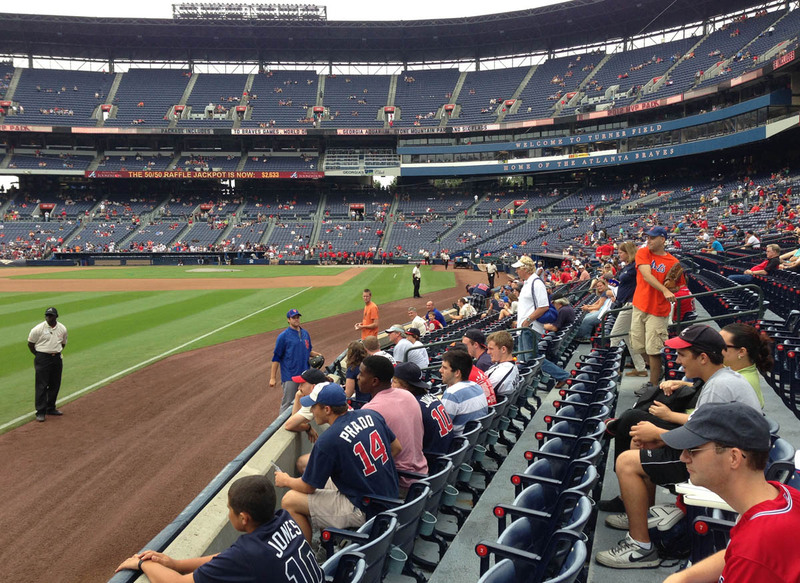 Given the fact that this was a Sunday afternoon game and the Braves and Mets had played the night before, I assumed there wasn’t going to be batting practice. And I was right. 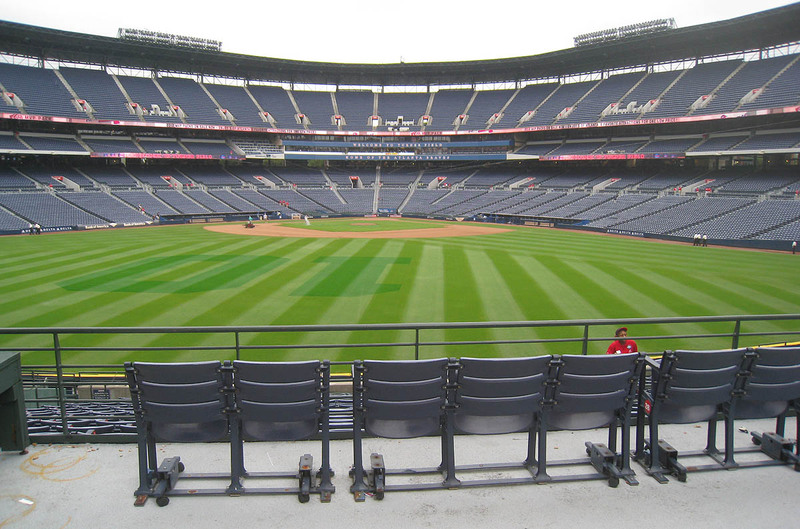 This was my view of the field when I first entered the stadium . . . If you’re appalled by the photo above, just be glad that (a) I didn’t show you more or (b) you weren’t in the next stall. 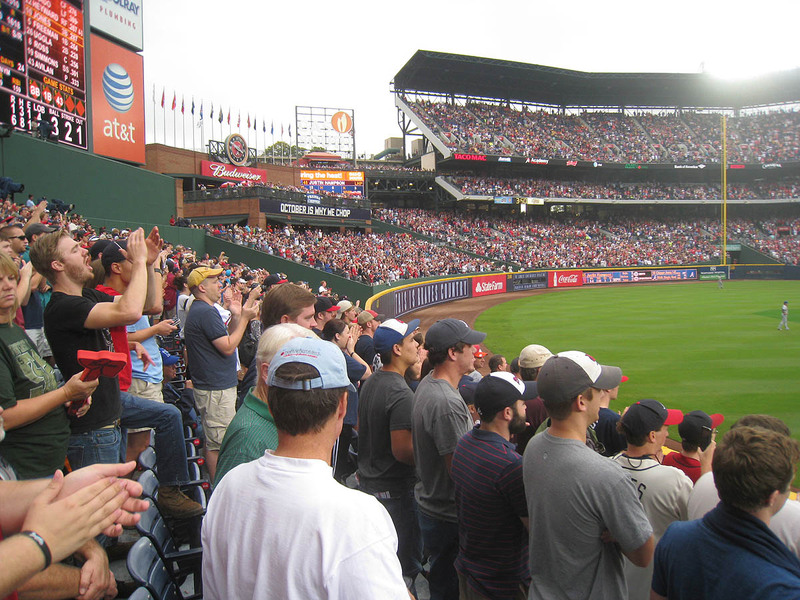 In the photo above, the player standing closest to the right field foul pole is Manny Acosta. (I realize he’s not close at all, but that’s an effective way of describing his placement on the field, no?) 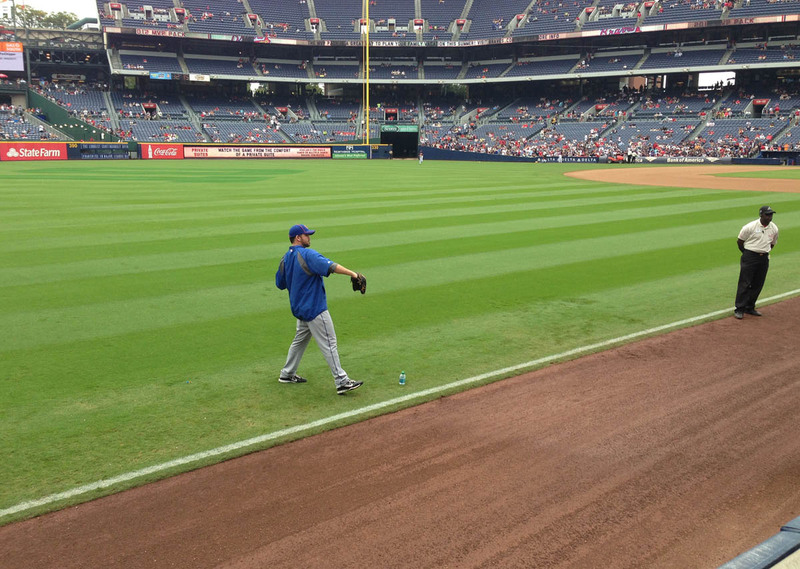 When he finished warming up, he chucked me the ball. Then I made another trip to the bathroom — a different bathroom. No point in returning to the scene of the original crime. Once again, when I made it out, there was more action on the field. 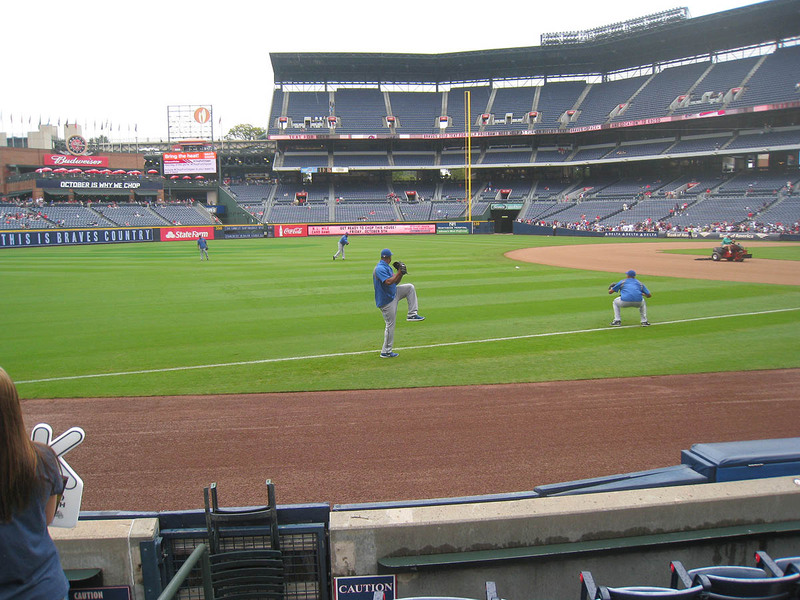 Several Mets pitchers were warming up, and bullpen coach Ricky Bones was standing around with a ball in his back pocket. I waited until he happened to glance in my direction. 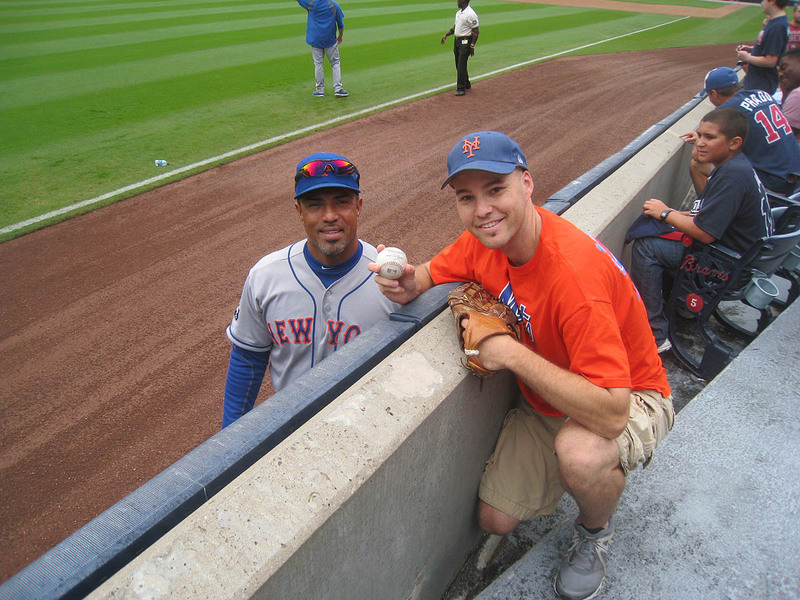 Then I held up my glove and casually asked him for it. 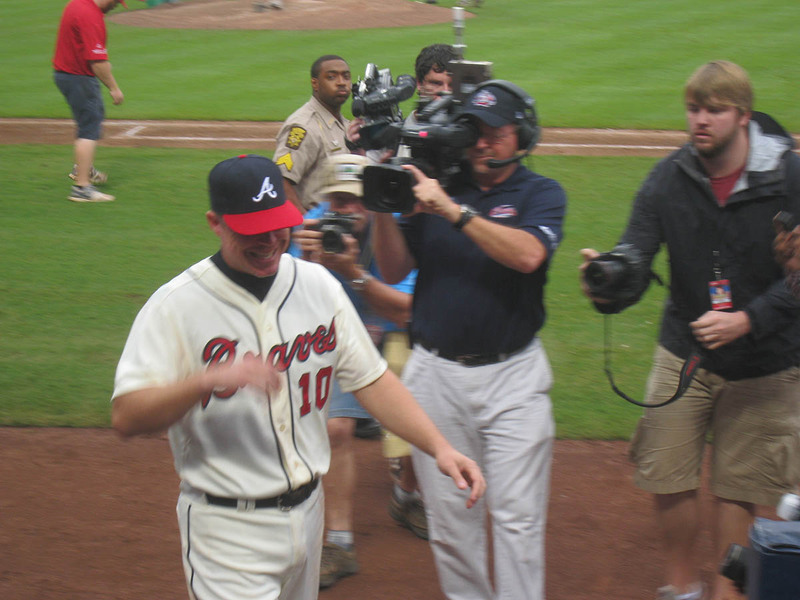 He gave me a funny look and walked right toward me in foul territory. “Wait, what?” I stammered. “How do you know who I am?” Aside from the ball that he’d tossed me in 1993 at the old Yankee Stadium, I’d never had any interaction with him, so I really did want to know how he recognized me. 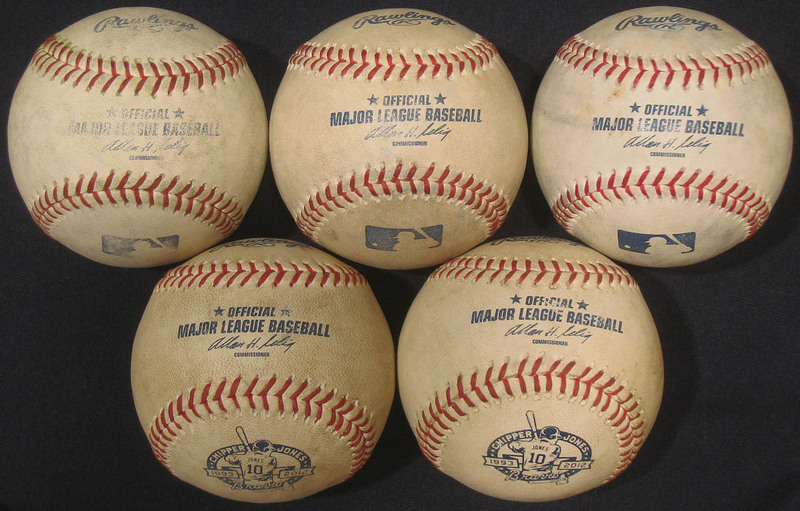 I told Bones about my baseball collection and about my charity fundraiser, and I made sure to mention that I frequently give baseballs to kids. (I also mentioned the helicopter stunt.) 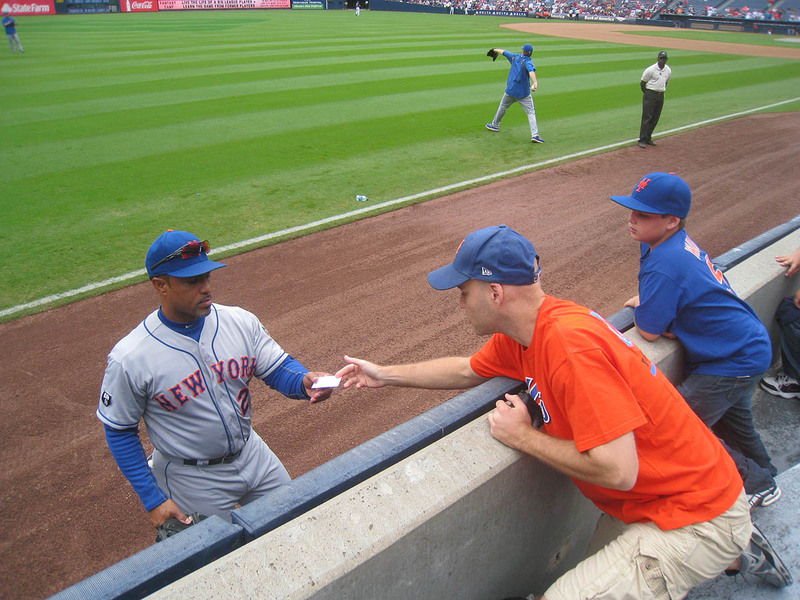 I was no longer trying to convince him to give me the ball that was still hiding in his back pocket; I just wanted him to know that I’m a decent guy and a diehard baseball fan. I told him he didn’t need to give it to me — that he’d already done enough by coming over to talk to me. “What number?” he insisted, still being friendly. Bones (whose name, FYI, is pronounced like the word “bonus”) wandered off for a minute, but then returned and asked me if there was anything on the internet about my fundraiser. I told him there was and offered to give him a card with my website on it. I expected him to say, “That’s okay, just tell me where to look it up,” but he gladly accepted it . . .
What a cool dude. 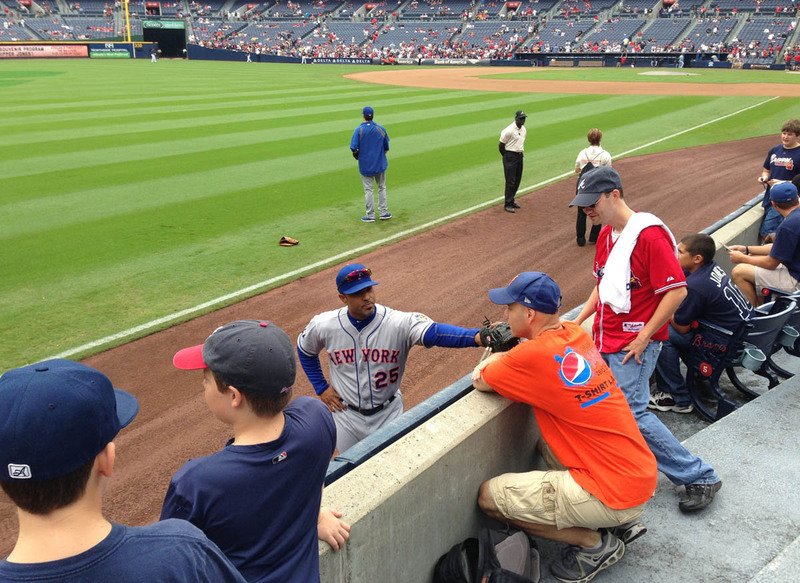 I hope the Mets bring him back next year. Here I am catching his throw . . . 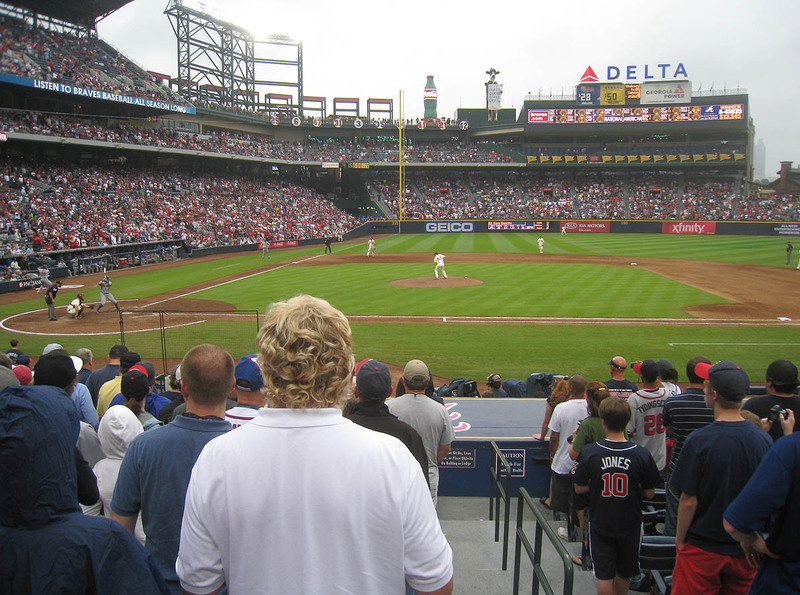 It would’ve been nice to play catch from more than 40 feet away, but the stands were fairly crowded, so it wouldn’t have been safe for me to move back much farther. Hampson and I played catch for a minute or two. I was throwing knuckleballs, and he was throwing a type of pitch that I’d never seen before. In fact, when I saw the ball coming out of his hand each time, I couldn’t understand how it was even possible. It was moving like a knuckleball — that is, with very little rotation — but he was gripping it like a palmball. After the first one, my jaw literally dropped and I walked toward the front row and asked how the hell he did it. He showed me how he held the ball tightly with his thumb and index finger . . . but he was also gripping it with his entire palm/hand. Then, when he released it, he flicked all of his fingers. I didn’t think it would be this hard to explain, and I still don’t know how in the world he threw it. After we finished playing catch, I asked him where he’d learned that pitch. He told me that a catcher in the minor leagues had taught it to him. Hampson said he can’t use it in a game because he can’t throw it more than 50 miles per hour. “He seems to be doing just fine without it,” he replied. How’s that for a fun ten-minute chunk of time? First I talked to Ricky Bones. Then I played catch with Justin Hampson and discovered a new type of pitch. 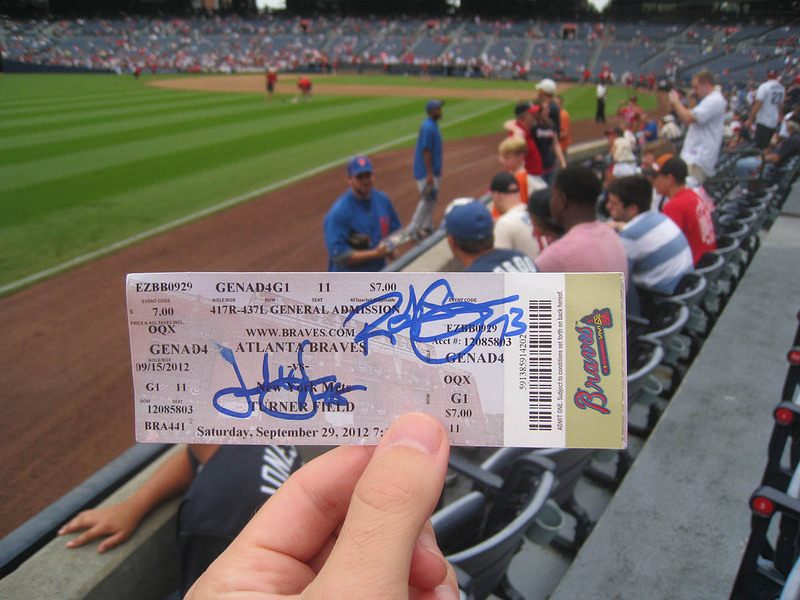 And then I got a couple autographs. In the photo above, do you see the guy wearing No. 28? That’s Daniel Murphy . . . and get this: when he finished throwing, he got *my* attention in order to hook me up with the ball. How did that happen? It was pretty simple, really. I was looking elsewhere and shouting at Lucas Duda for a ball; when Murphy saw that I didn’t get it, he held up *his* ball and waved his arms. I noticed him out of the corner of my eye, and when I turned to face him, he threw it to me. That was my 4th ball of the day. 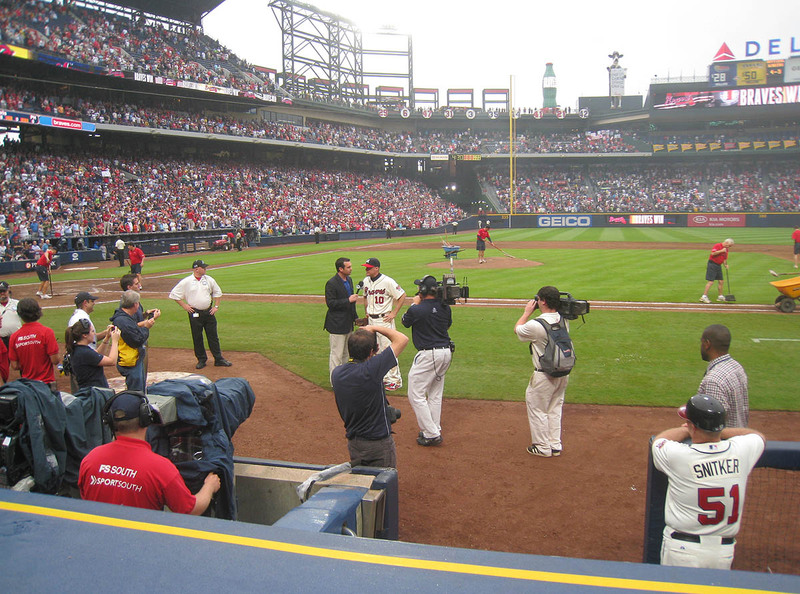 He waved to the crowd . . .
. . . and received a thunderous ovation. No, wait, it might’ve only been three minutes later. It happened really fast. Ruben Tejada led off the game by taking a called strike from Kris Medlen and then grounding out on the next pitch. Daniel Murphy was the next batter, swung at the first pitch he saw, and slashed a foul ball off the protective screen in front of the Mets’ dugout. 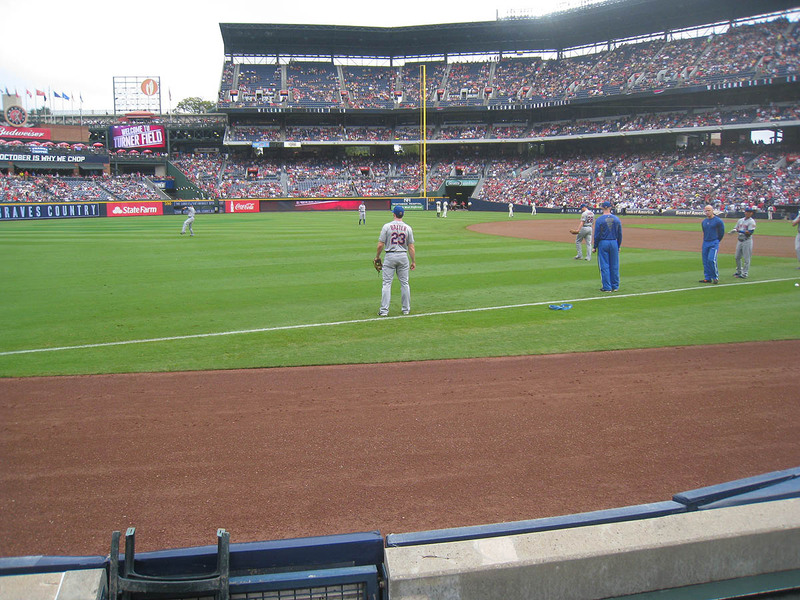 By the time the ball ricocheted to 3rd base coach Tim Teufel, I was standing in the front row and shouting for it. Third pitch of the game. Nice. 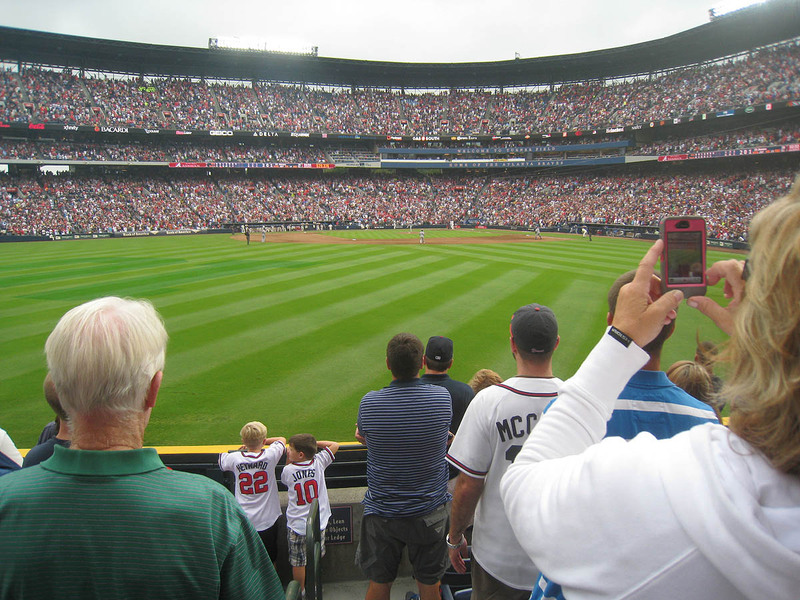 This was my view when Chipper led off the bottom of the 2nd . . . The crowd was going absolutely berserk. 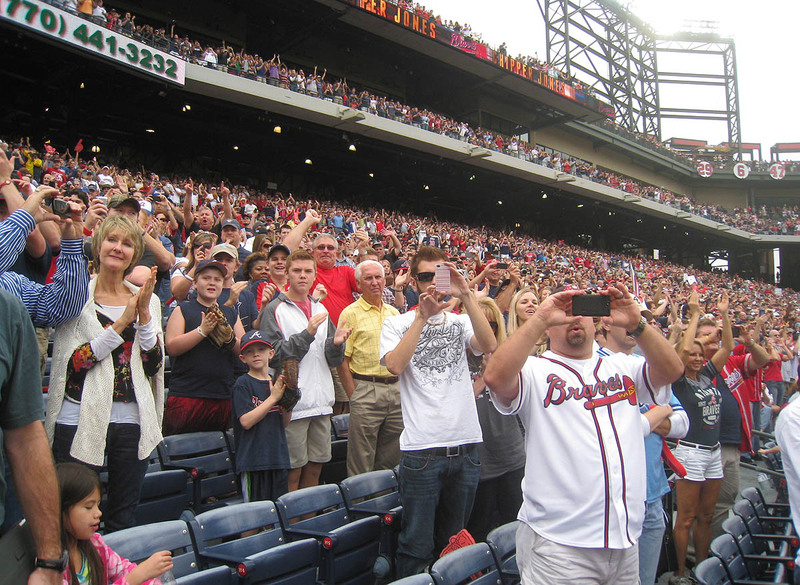 For most of the 50,635 fans in attendance, this was going to be the last game they’d ever see him play. 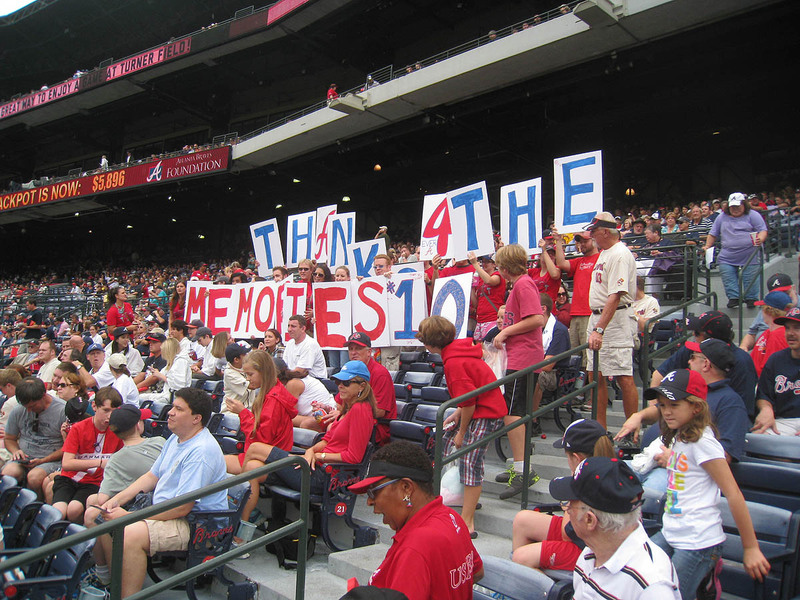 Seeing the outpouring of love from everyone in the stadium gave me chills. In case you can’t tell, that’s an elderly woman holding the sign. Everyone around me was cracking up. Look closely at the jumbotron again. 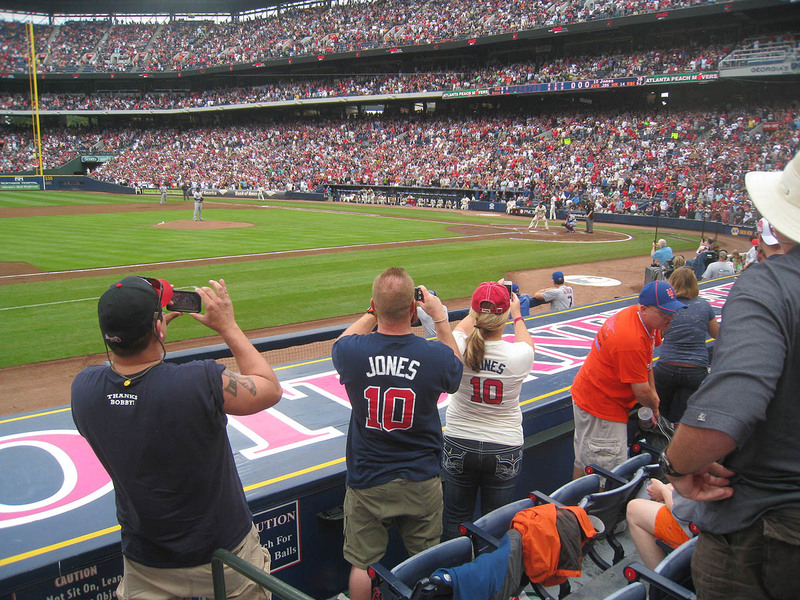 See the fan wearing the white Braves jersey? See the word “chemo” on the white sign that she’s holding? 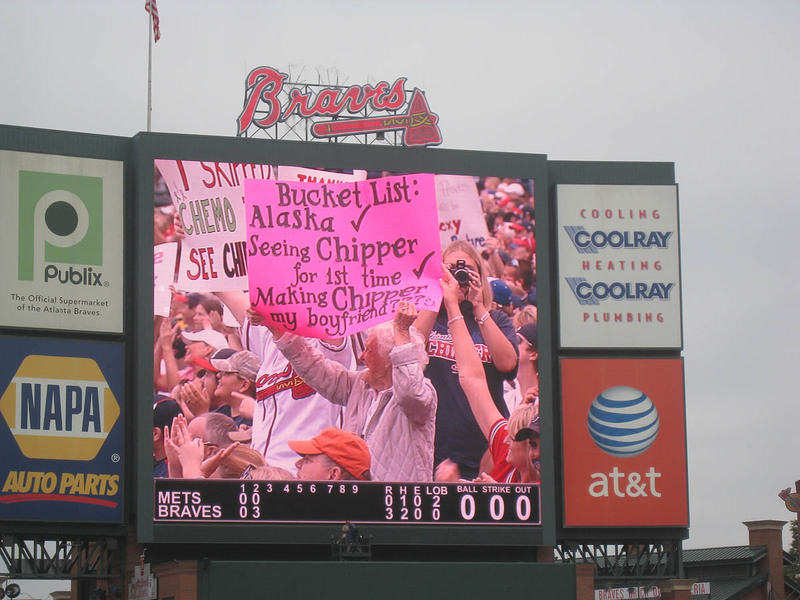 The sign says, “I SKIPPED CHEMO TO SEE CHIPPER,” and she ended up making headlines as a result. 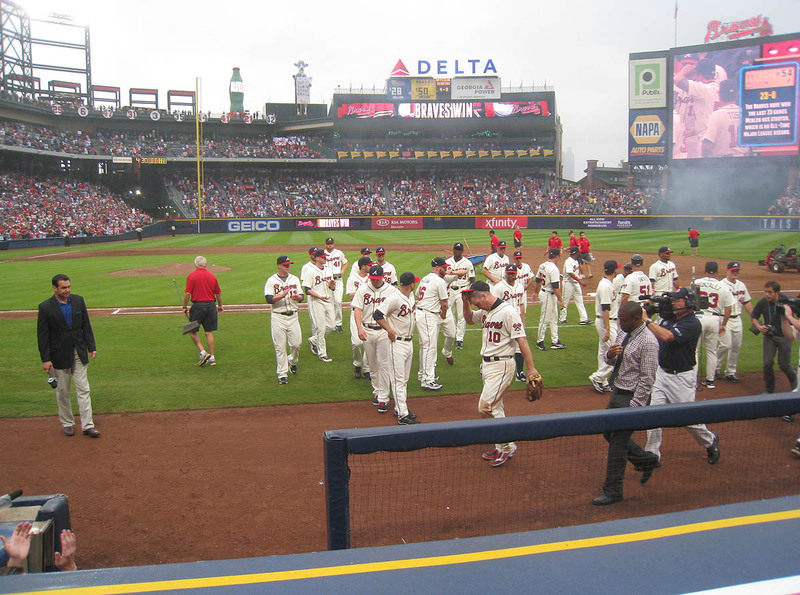 Turner Field was rockin’. It felt like a playoff game without all the tension. It was a party. That’s really the best way to describe it. 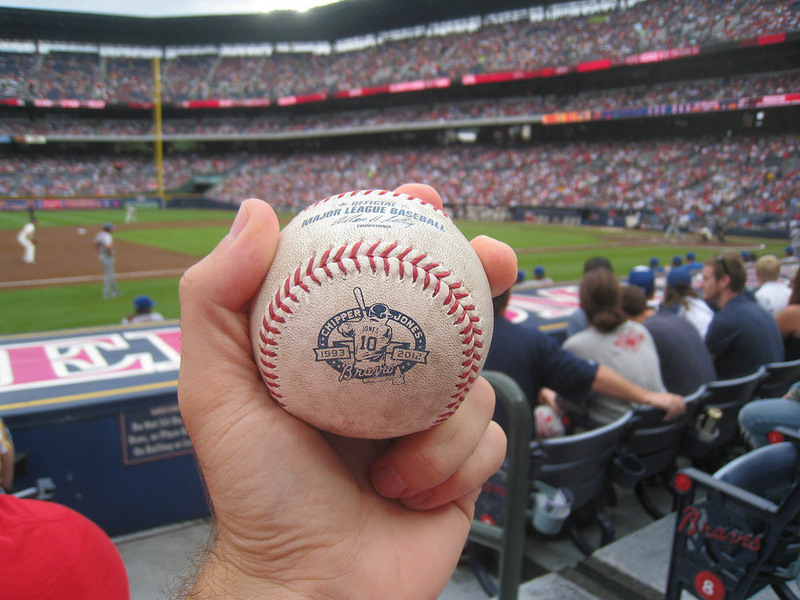 It was just like all the other 3rd-out balls that I’ve gotten over the years, except it had a Chipper Jones commemorative logo — my 4th such ball in two days. 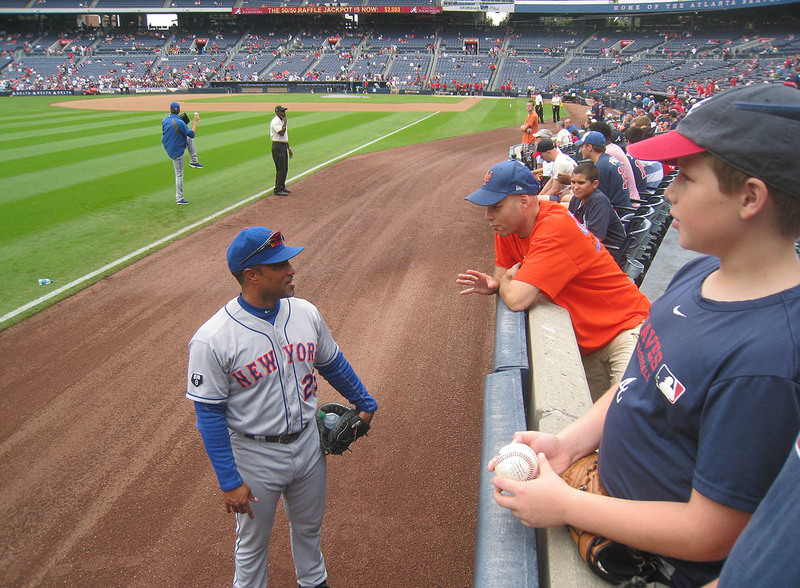 After that, I gave a non-commemorative ball to the nearest kid and left the section for good. I spent a couple innings playing the tunnels behind the plate for foul balls . 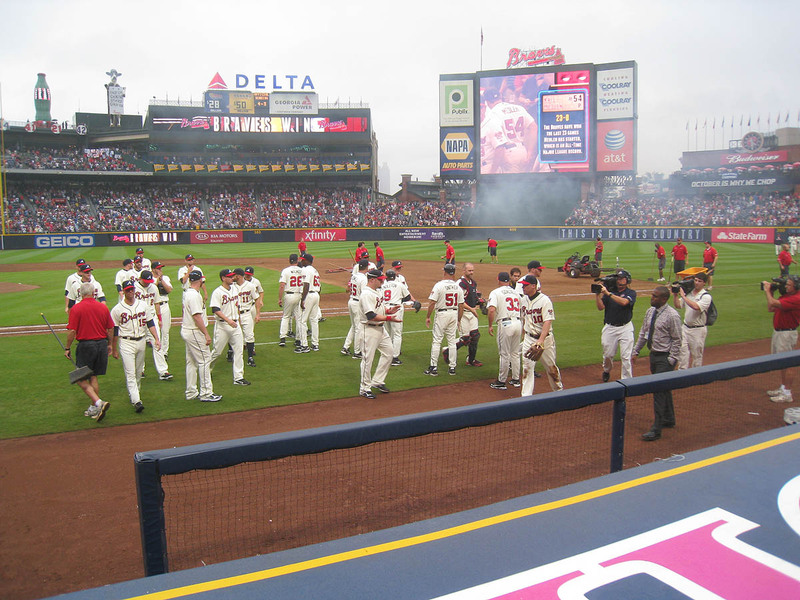 . .
Wouldn’t it have been nice if Chipper had hit a home run right to me? 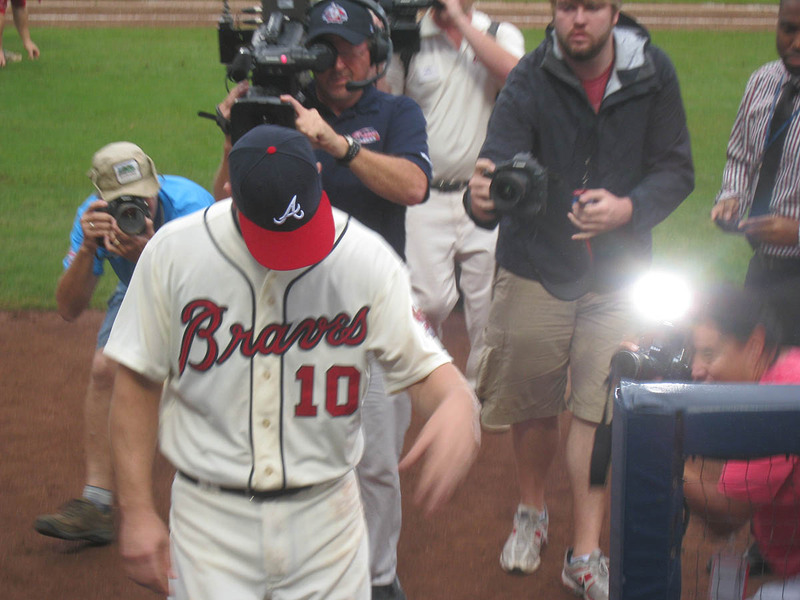 Yeah, well, he walked instead, and everyone booed. 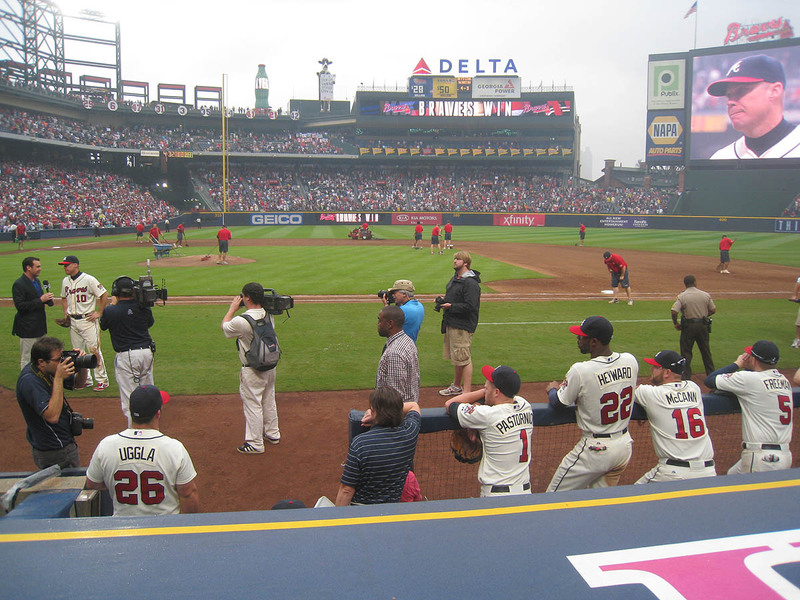 Being behind the Braves’ dugout seemed like a good idea. 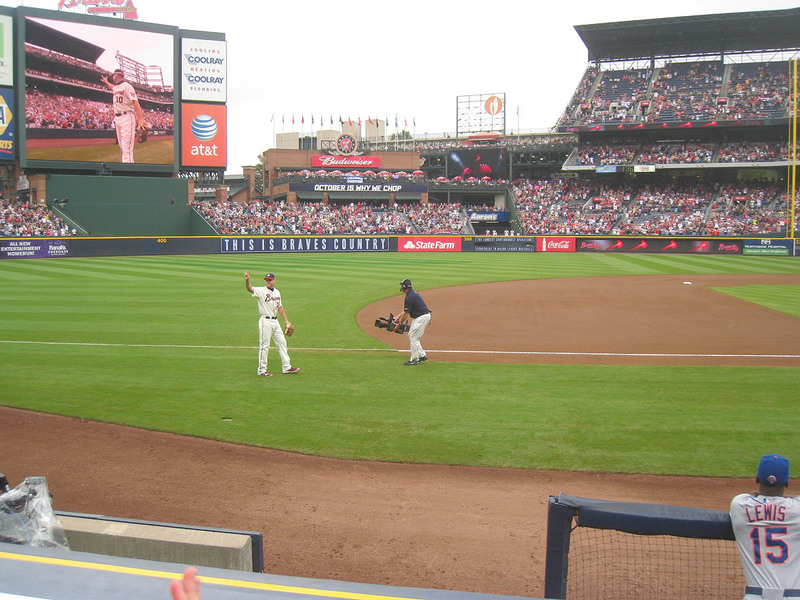 Not only was there a slim chance that a player would end up tossing a random piece of equipment into the crowd, but more importantly, I’d have a great view of Chipper. I knew there’d be something happening after the game, and I wanted to be as close as possible. Justin Turner (pictured above at bat) led off the 9th inning by flying out against reliever Cory Gearrin. Ike Davis followed by hitting a double, and with two outs, he advanced to 3rd base on wild pitch. 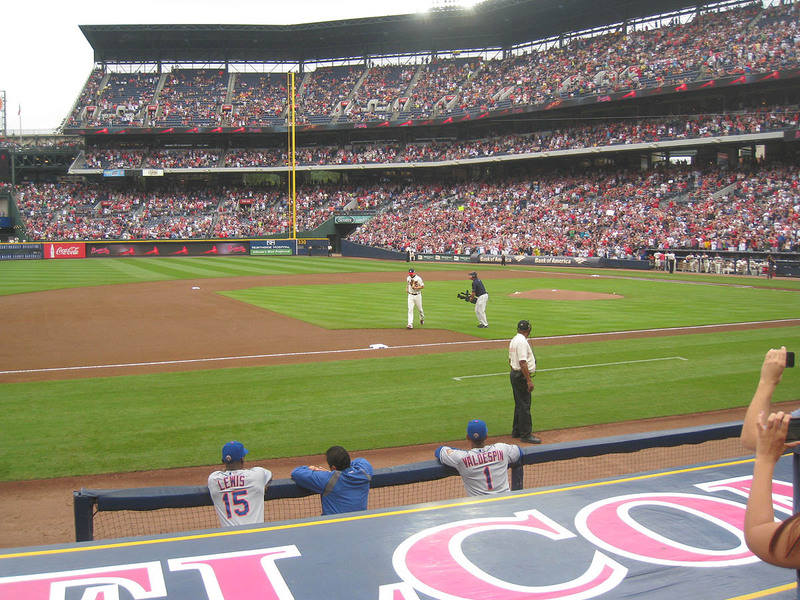 After that, Lucas Duda walked, Andres Torres hit an RBI single, and Craig Kimbrel came in to pitch. Craig Kimbrel is very good. The game ended three pitches later. I could tell by his body language that he was extremely emotional. 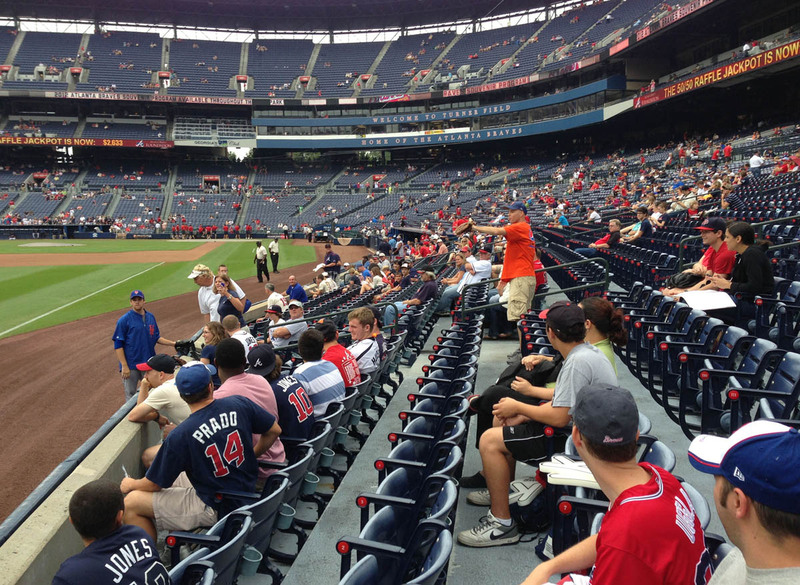 By the way, just after I took that photo, Kimbrel tossed the final-out ball into the crowd. It landed three rows deep and roughly seven feet to my left. 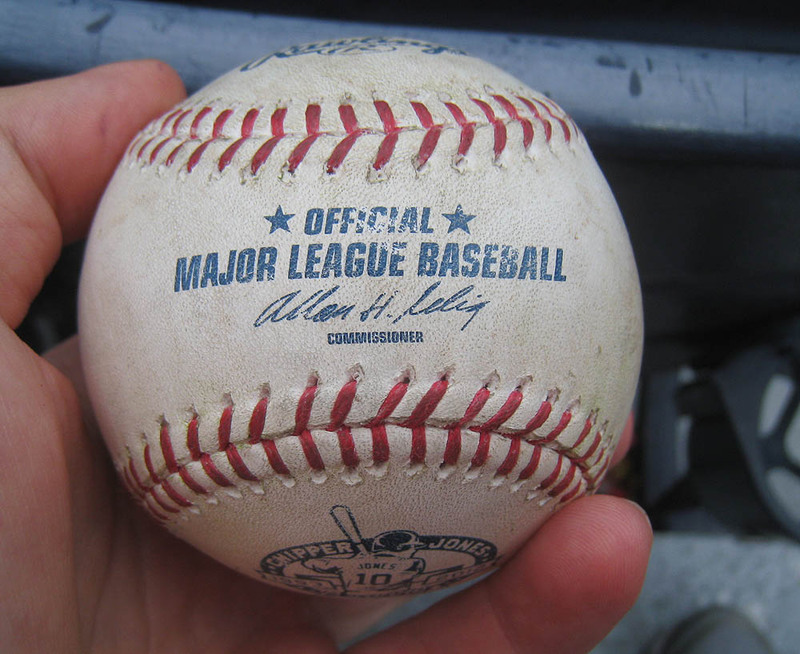 Then it got bobbled back toward the field, and was snagged by a gloveless girl two people next to me in the front row. I would’ve LOVED to get that ball. Not only had Kimbrel used it to record his 42nd save of the season, but as you’ll soon find out, this was a historic/record-breaking win. Here’s a closeup of him . . .
No one had left. It was impressive. 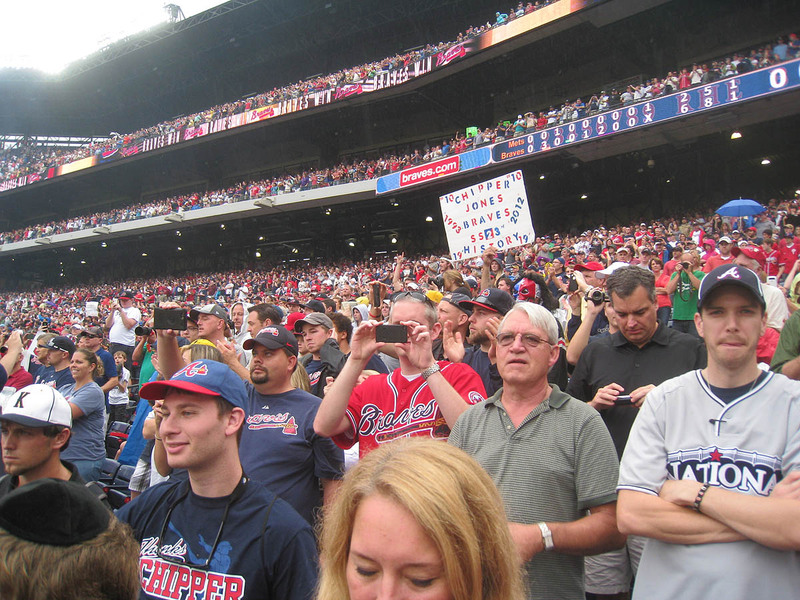 Braves fans showed tremendous passion and class, and I have a whole new level of respect for their organization. 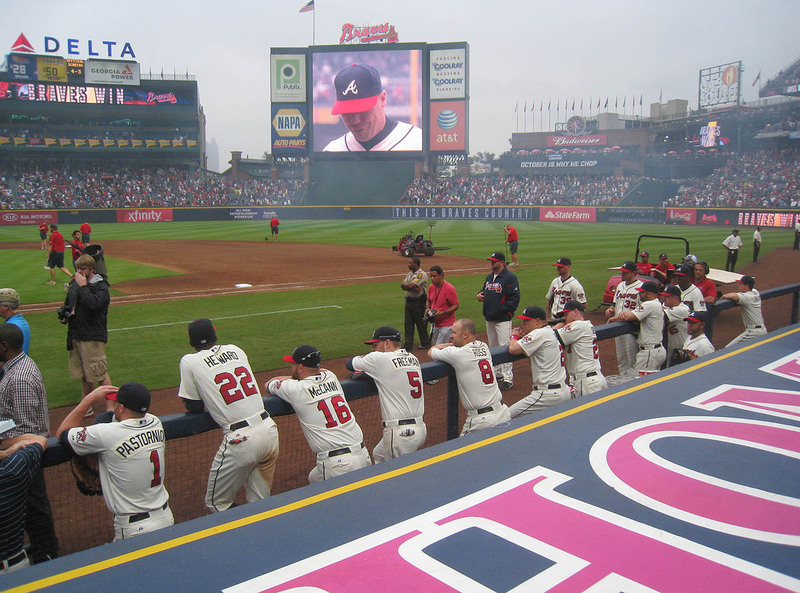 It’s my favorite because there’s lots of stuff happening all at once: Chipper is on the jumbotron, his teammates are watching him, one of the photographers is shooting them, and so on. 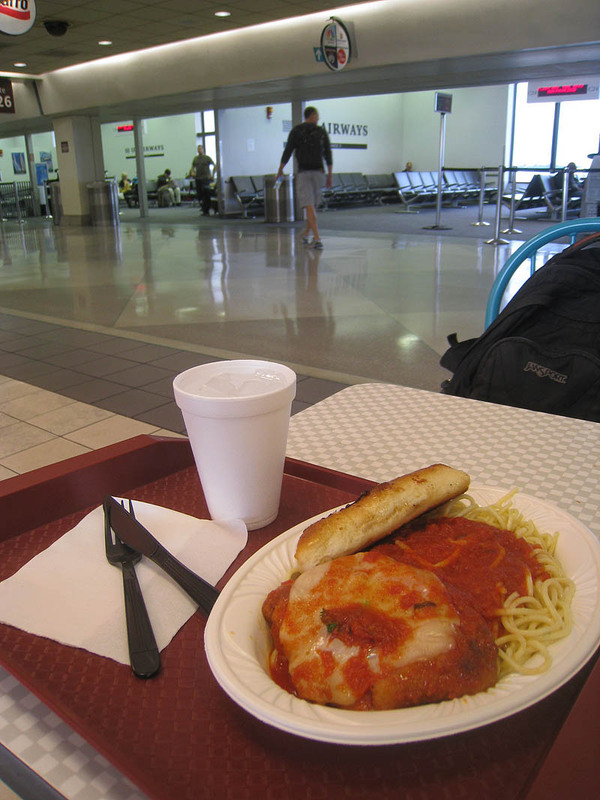 I posted that photo on Reddit and got 543 upvotes. As far as I could tell, though, he didn’t . . . which is weird. Hell, *I* almost cried. Chipper put his hat back on . . .
. . . and forced a smile . . . 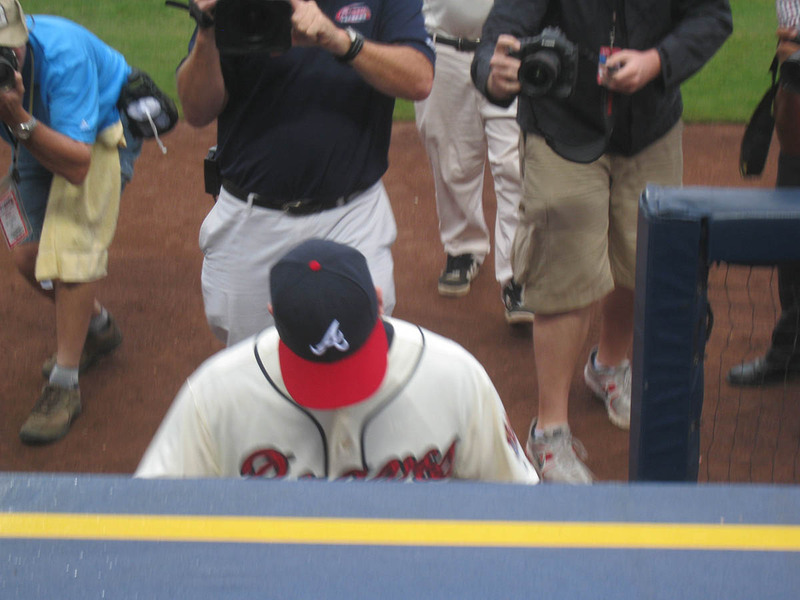 Pretty cool to be RIGHT there when he walked off the field. I wonder if I’ll ever see him again. And to think . 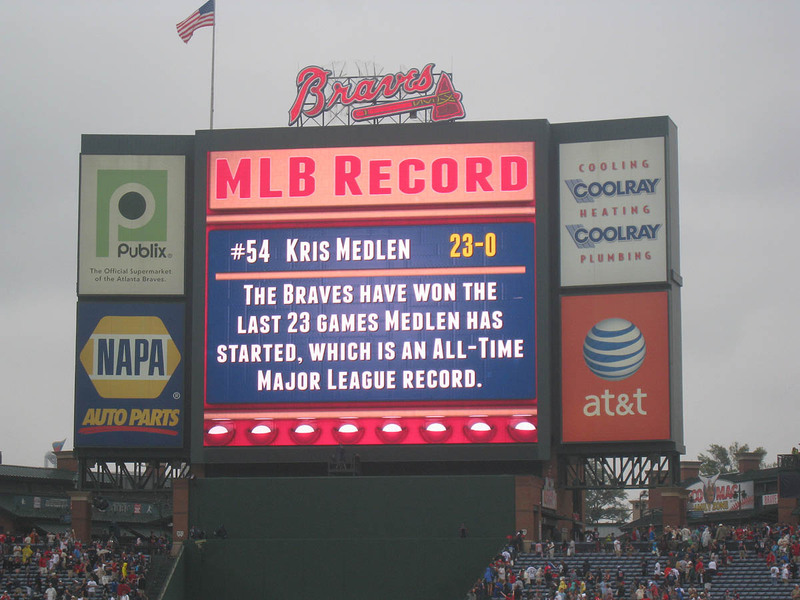 . . Medlen threw just 79 pitches in this historic performance, and I snagged one of them. • 613 balls in 76 games this season = 8.07 balls per game. 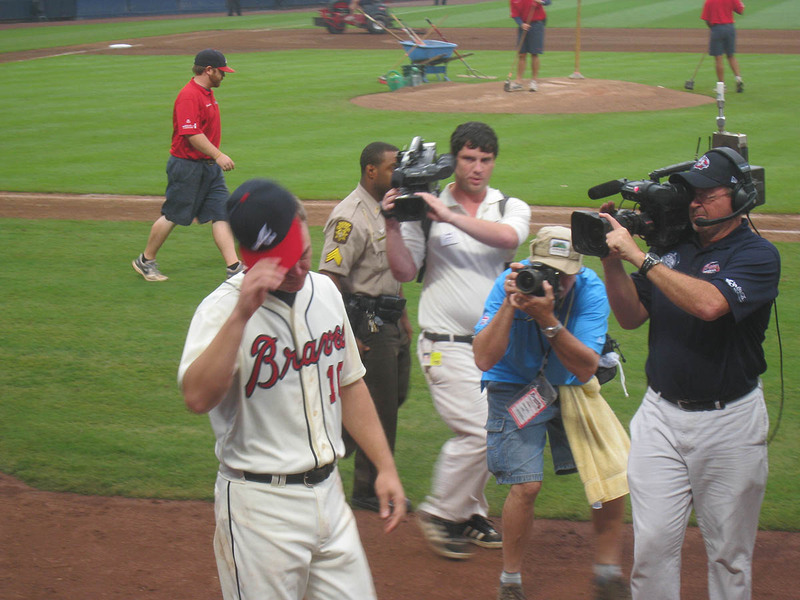 Man, wouldn’t that have been sweet if Chipper had tossed you his hat! I couldn’t help but laugh at the bathroom photo. Probably the caption that did me in. Hope you’re feeling better. As for the other stuff, I’m not surprised. Old hat by now. Always impressive. I totally saw that pic on reddit, I remember thinking it was cool how the person got him and his face on the scoreboard in the same shot. How in the WORLD did I not notice YOU took it, especially considering your username is zackhample?? Maybe I just assumed it had to be from an Atlantan I couldn’t possibly know. I didn’t even consider that. I probably would’ve jumped out of my shoes. I’m offended (not really) you didn’t realize it was ME on Reddit. Shame on you! Yeah, I too immediately thought you should’ve asked for his hat. I know I would’ve (a la Prince Fielder’s Batting Gloves). 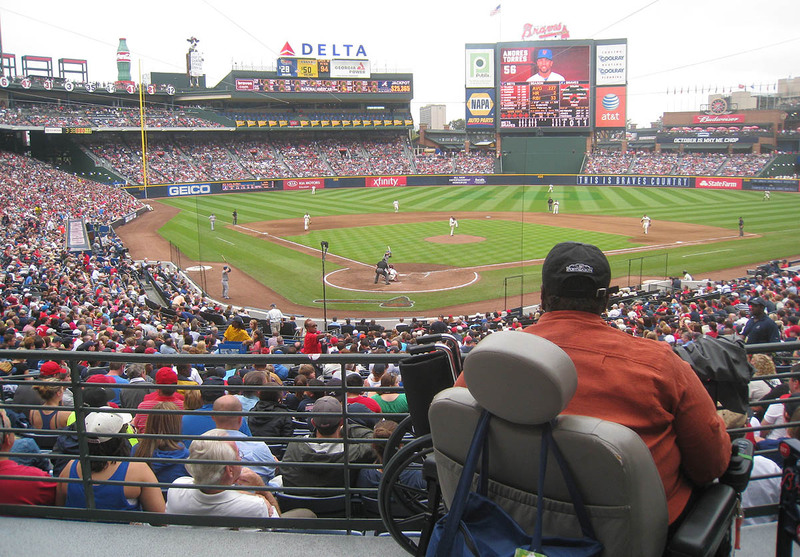 I just watched the news report on that fan with the CHEMO sign–the Braves are giving her two tickets to tonight’s Wild Card game. 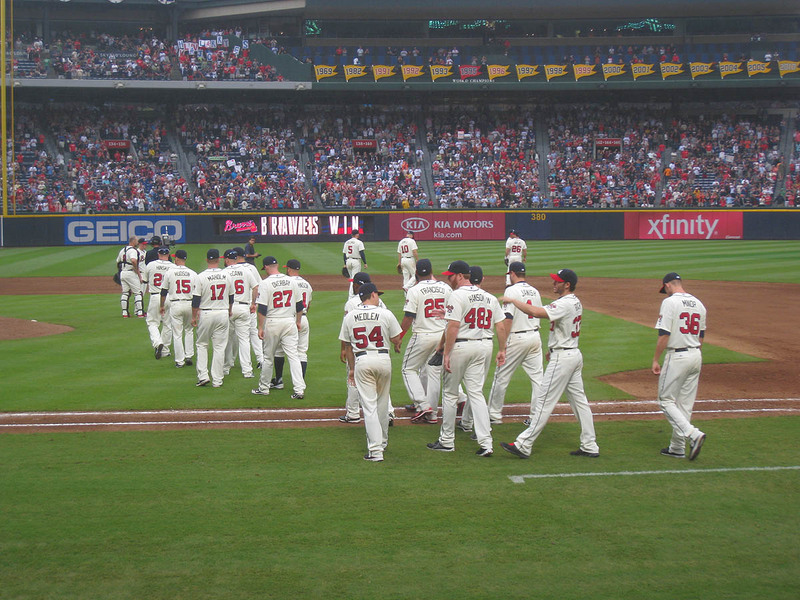 Well done, Braves. Well done. 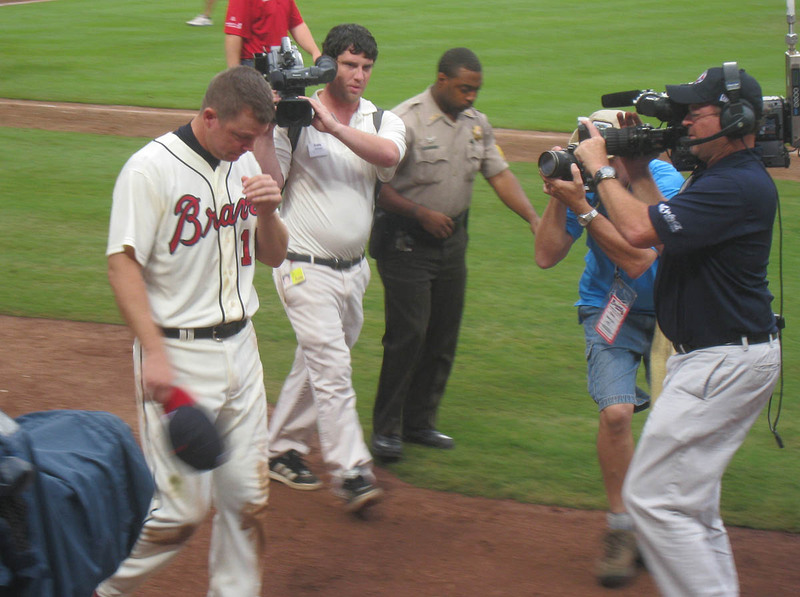 And that, coupled with this being Chipper’s last regular season game (blog post) almost had ME cryin’, Zack. Please note the proper use of my commas. My Mom’s ashes are spread all along the track where you and Bones were posing. Ssshhh!!! Wish I’d thought of it, but I don’t know . 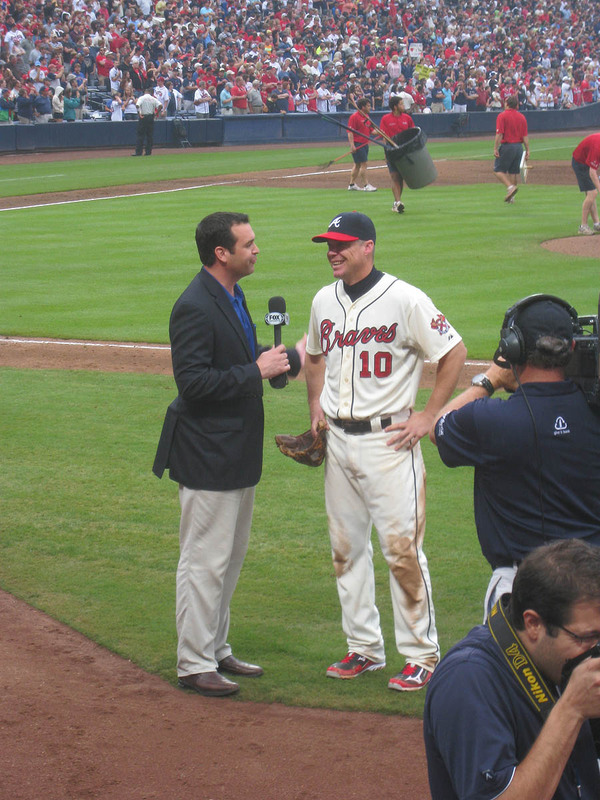 . . that was Chipper’s moment so it’s good that I kept my mouth shut. 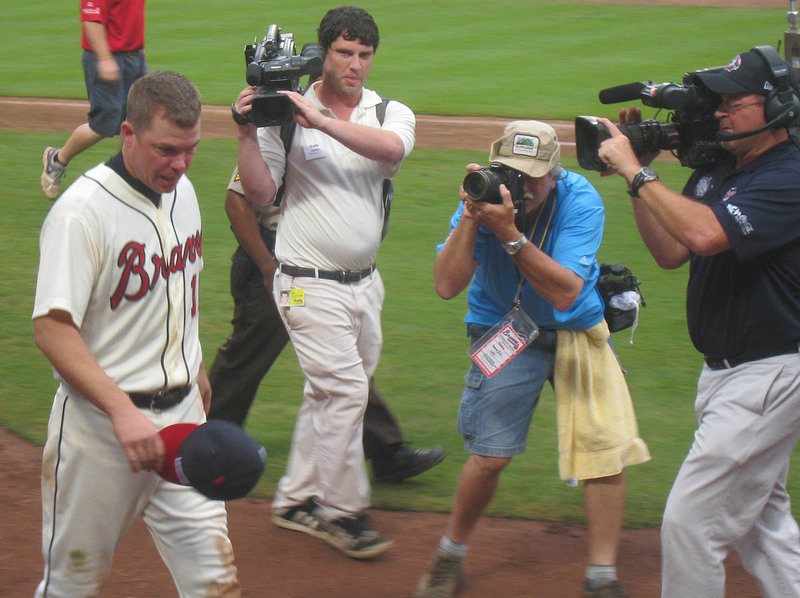 Chipper Jones. Causing mass hysteria.